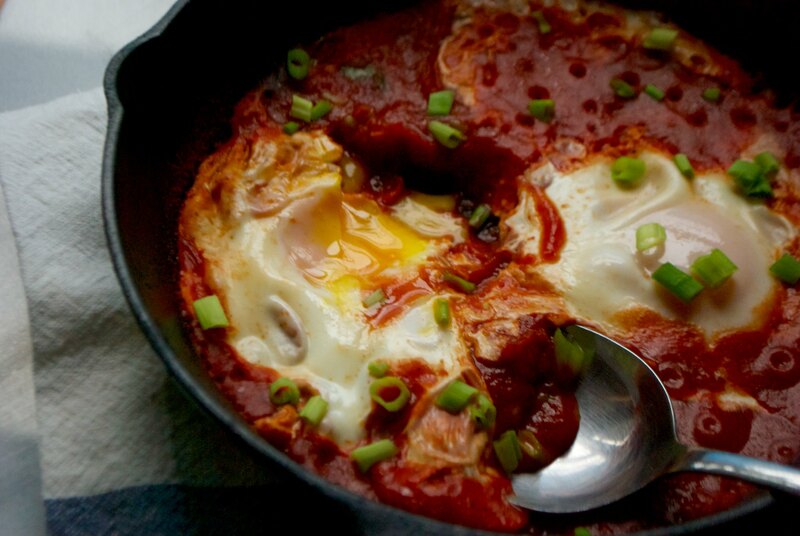 Of course, this take on shakshuka is extremely fast and easy. Garlic and green onions are chopped and sautéd. A couple of spoonfuls of store bought harissa go in the pan. I use a tube of DEA brand, because that’s what my grocery store carries. Add canned tomato sauce, and tomato paste to make it taste like it was simmered for much longer. Stir, let it bubble, add a couple of eggs, cook covered for a couple of minutes. Salt every step of the way. I’ve made this more than once in the past week because it was just that fast, easy, and good. You’ll either want to serve this in a scratch-proof pan (cast iron, stainless steel, aluminum, enameled cast iron, etc. ), or cook it in a nonstick pan and serve it on a plate. 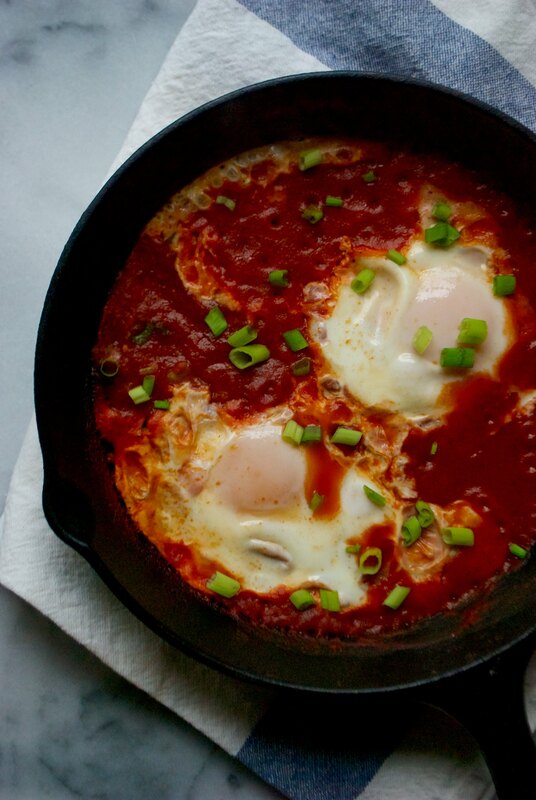 I like a mini cast iron skillet for this recipe, and eat the shakshuka straight out of the dish. But if you’re going the cast iron route, be sure to use a very well seasoned pan, and properly clean and oil the pan as soon as you’re done eating! The tomato sauce can wear at the beautifully seasoned surface. I love this dish as an easy dinner, but it does remarkably well at breakfast or brunch. Scale up in a bigger pan for a crowd– everyone will love this on Sunday morning, and it’s light enough and healthy enough to not weigh you down the whole day. 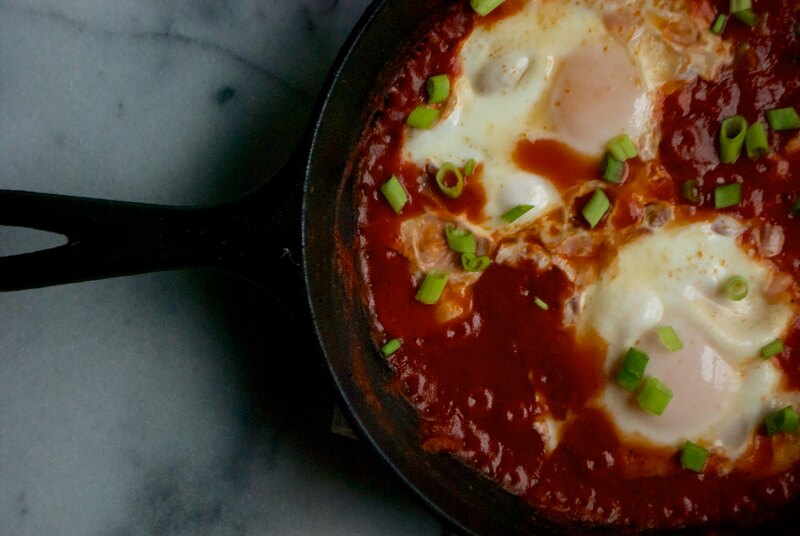 A simple and easy twist on shakshuka. Heat a couple of teaspoons of oil in a small pan. Add the chopped white stems of the green onions, and the minced garlic. Sauté over medium heat until the green onions are wilted and the garlic is fragrant, but not browned, about a minute. Add the harissa to the pan and sauté for another 30 seconds or so. Add the tomato sauce and paste. Stir to combine, and salt to taste. Bring the tomato sauce to an even simmer, 2-3 minutes. 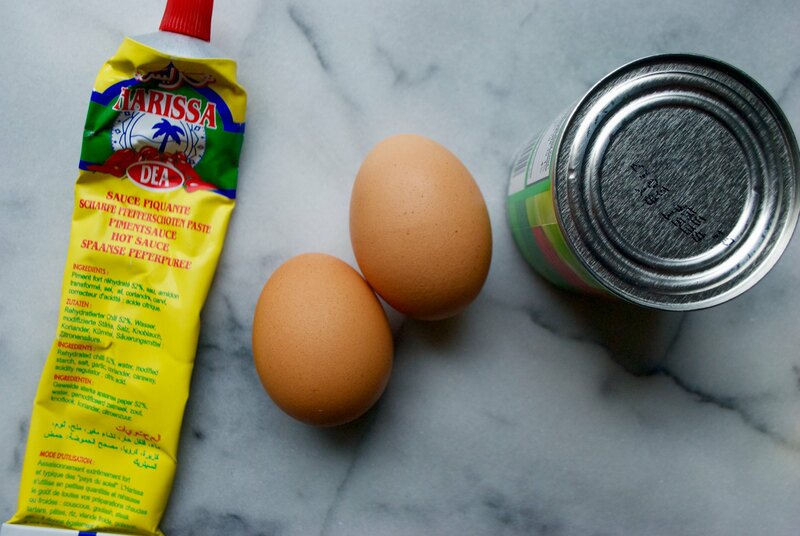 Using a spoon or spatula, push some of the tomato sauce aside, creating two small indents or “nests” to crack the eggs into. 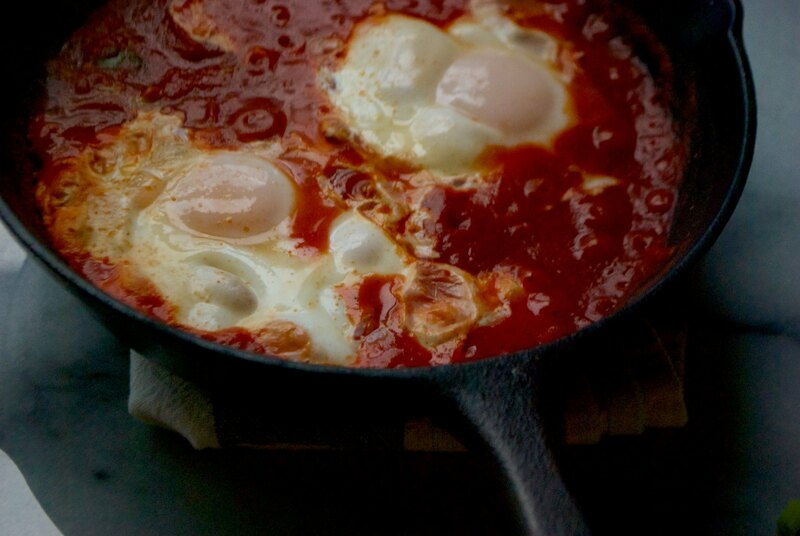 Crack the eggs into the tomato sauce mixture, cover, reduce heat to low, and allow to cook for another 2-3 minutes, until the egg whites are set and yolks remain runny. Sprinkle with salt and garnish with chopped green onion tops before serving. Serve directly from the pan for best presentation. Adapted from Skinnytaste & Smitten Kitchen. Your photos look awesome and I’m super impressed that there was no natural light 🙂 Love anything with harissa in it and this recipe not only looks delicious but is easy and quick (two things I like very much!). Trying this soon for breakfast and/or dinner. Thanks for sharing! Thank you Karrie! 🙂 There was actually just the tiniest bit of natural light left, just had to rush to catch it! I definitely recommend making this recipe, it’s so fast and tasty.